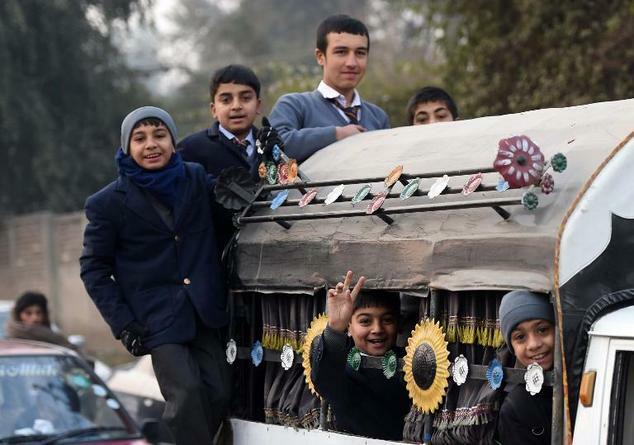 Child survivors of Pakistan’s worst ever terrorist attack returned to the school where Taliban militants massacred their classmates Monday, with both the students and their parents expressing a mixture of defiance and apprehension. The December 16 attack on the Army Public School in Peshawar by a group of gunmen and suicide bombers claimed the lives of 150 people, mostly children, and prompted a bout of national soul-searching even in a country used to high levels of militancy. Across the country, schools had remained shut for an extended winter break as authorities beefed up security measures. “I have lost 30 of my friends, how I will sit in the empty class, how I will look to their empty benches,” he told a foreign news agency before the school reopened. At least 20 soldiers were seen at the main entry point of the Army Public School, with an airport-style security gate installed at the front. Elevated boundary walls with steel wire fencing have been put in place in some schools around Peshawar and nationwide as staff rang bells to signal the start of the day. Raheel Sharif, the head of Pakistan’s powerful army, made an unannounced visit with his wife, greeting students with handshakes and hugs. In an emotionally charged and nervous atmosphere, parents, some crying, met army chief Gen Raheel Sharif who had travelled to Peshawar to address them in a private meeting. “The army chief didn’t make a speech but individually met the parents and assured them they would eliminate the terrorists from the country,” a security official told a foreign news agency. But some parents, especially those grieving their children, stayed away from the meeting with the army chief, saying it was too painful for them to go back to the school. “Yes I was invited to the function and meeting with the army chief. I couldn’t dare to go to the school where my sweet son was ruthlessly killed,” said one father. “And what would I get from meeting the army chief when they couldn’t even save my young son and children of many other parents? “He was terrified but we talked him up, we can not keep him imprisoned between four walls and we must stand against militancy,” Muhammad Zahoor said as he walked his son along the main Warsak Road. “I want to go to school to see my friends, I will join the army after my schooling and will take revenge,” said Muhammad Zaid, his son. Of the 150 victims killed in Pakistan’s deadliest-ever attack, 134 were children. Survivors recounted Taliban gunmen moving from room to room hunting for students and teachers, sometimes toying with them and pretending they would let them go, before lining them up and executing them in front of their peers. Like Muhammad Zaid, many struck a defiant note. “I am not scared, no force can stop me from going to attend my school, I will go and will tell the attackers, ‘we are not afraid of you’,” said 16-year-old Zahid Ayub, who sustained minor wounds. Meanwhile other parents across Pakistan spoke of their fears in a key psychological moment for the nation. “Driving to school in the light of a quietly subdued rising sun. There’s a kind of stillness in the air. It sounds like a million mothers saying a silent prayer as they drop their babies to school. Stay safe. Stay safe,” wrote Saima Jamil Ashraf, a parent in Karachi, on Instagram. Pakistan has strengthened its offensive against the Taliban since the Peshawar attack, ending its six-year-old moratorium on the death penalty in terror cases last month in the wake of the massacre. Last week the government announced it was setting up nine military courts to hear terrorism-related cases, prompting concern from rights groups who believe the army will use the crisis to wrest more powers from the civilian government. The country’s liberals meanwhile have held protests to pressure the government into arresting clerics who praise the Taliban, as well as crack down on sectarian and anti-India militant groups who operate with relative impunity. Analysts warn that Pakistan must end its dualist policy that permits ‘good’ militants while taking action against ‘bad’ militants if gains against extremism are to be made sustainable. These are all brave students and they will do word hard and finished the terrorism with education power. Cut relationships with saudis – terrorism will end in days in this region. Its very simple.